Whenever a new phone comes out, Spigen naturally makes its usual wallet case for that particular phone – you know, the kind that folds open to reveal a few slits to accommodate various cards. With the arrival of the iPhone 6, however, the case maker decided to mix it up and reinvent its wallet case. Enter the Spigen Slim Armor CS Case for the iPhone 6, which is an alternative spin to the usual wallet case we see from them. 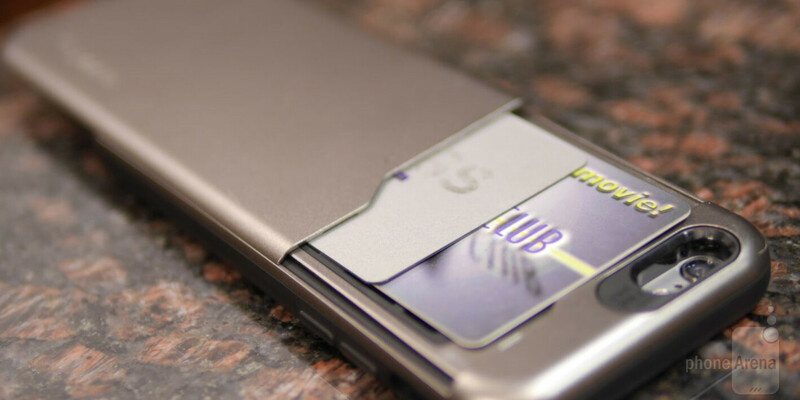 First and foremost, the Slim Armor CS Case favors the design of a typical protective case – whereas with its previous effort, they were fashioned to look more like a wallet first with their folding cover design. Being part of the Slim Armor family, the case is comprised out of an inner matte TPU material for shock absorption thanks to its Air Cushion Technology, and an outer matte polycarbonate frame that’s meant to primarily protect it from scratches and blemishes. On the surface, it looks a bit generic and bland, despite the four different paint jobs it’s available in. Interestingly, it features a useful card slot in the back of the case that accommodates up to 2 credit cards or IDs. Accessing the slot is pretty simple by just sliding down the cover, where the slot is then exposed. Of course, it’s a nice addition that eliminates the need for us to carry our wallet when we’re out on the weekend, but it’s not enough to fully replace our traditional wallet. Well, to its credit, Spigen doesn’t intend for its case to do that, but rather, it’s a pleasant alternative if you want to consolidate and travel light. Online, you can pick up the Spigen Slim Armor CS Case for $39.99 normally, but it’s on sale at the moment for $23.99 courtesy of Amazon. The price, obviously, is well within the same scope as the previous wallet cases from Spigen, but this is a refreshing new concept that makes the wallet portion of the case discrete.